This review first appeared in the June 2009 issue of hi-end hifi magazine High Fidelity of Poland. You can also read this review of the Harbeth Super HL5 in its original Polish version. We publish its English translation in a mutual syndication arrangement with publisher Wojciech Pacula. As is customary for our own reviews, the writer's signature at review's end shows an e-mail address should you have questions or wish to send feedback. All images contained in this review are the property of High Fidelity or Harbeth. - Ed. 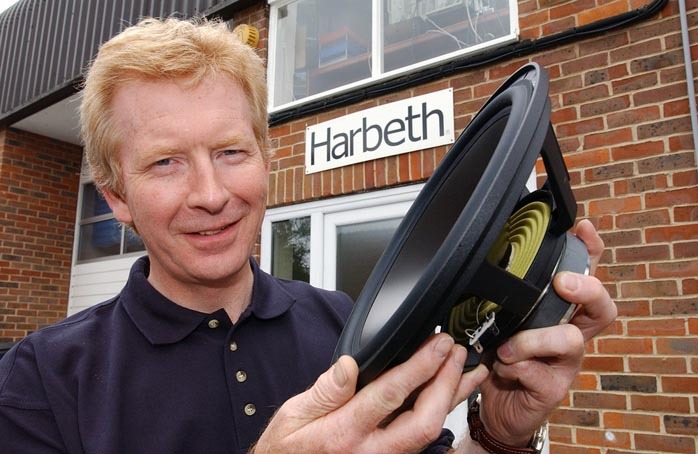 The website description of the company begins as follows: "Our Harbeth factory is located in Lindfield. Lindfield near Haywards Heath, in West Sussex (south of London), England is a mediaeval village with a unique range of houses dating from about 1300, all lived-in and beautifully preserved. The population is about 3,000 and we have a strong community spirit which is intimately bound up with what we do at Harbeth." You won't hear such statements every day, especially not from a company that should be at the forefront of technological innovation. Because that's what audio is all about - taking from the best and newest to create nirvana during music listening. At least I think so. However Harbeth Audio Ltd. is a different company. Founded in 1977 by Dudley Harwood, former head of research at the BBC, its name is an amalgam of his surname HARwood and his wife's first name elizaBETH. Harwood was one of most well-known engineers of his time, the animator of the British scene since the 50s. But this story begins well prior to the company's formation in the early 70s when Dudley was still employed by the BBC. One of their most important requirements was a small nearfield monitor that could be used for mobile transmission studios. This is how the LS3/5a was created, the best-selling and longest produced model in all of loudspeaker history. It is also important to note that this occasion launched the career of plastic loudspeaker membranes. The two engineers responsible for that were Dudley Harwood who designed polypropylene diaphragms, and Spendor founder Spencer Hughes, the father of the Bextrene diaphragm. The Harwood couple developed the company with splendid products but they never succeeded at surpassing the first stage to convert it into a bigger business. That's why in 1987 Alan Shaw bought it, nota bene the first European working at the Japanese NEC. He had everything to become successful - a fantastic product and passion and knowledge not only of the electroacoustic but also business kind. Harbeth blossomed and became one of the most important players in Japan and the Far East. 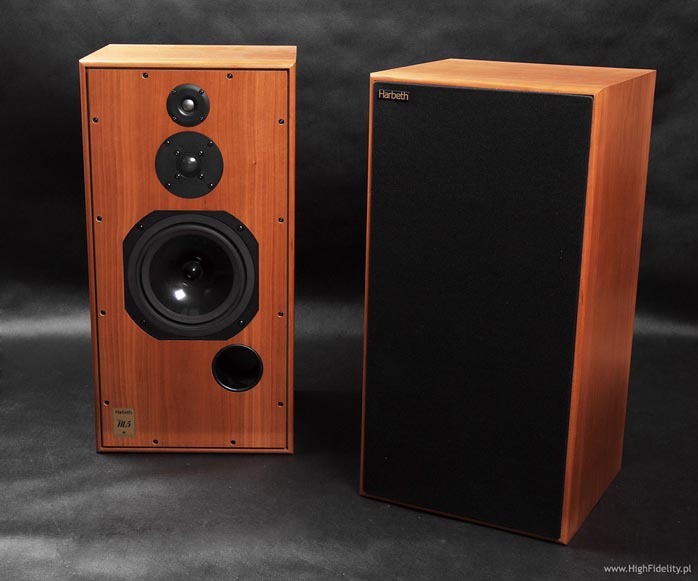 The first Harbeth product was the HL Monitor known as the MK1, the world's first speaker with a polypropylene diaphragm. The model Super HL5 on test today is its direct successor. In its 6th generation, it maintains the classic BBC proportions and volume (two cubic feet) which characterized the LS3/6 BBC model for example. It uses a proprietary 200mm woofer with a Radial diaphragm, a SEAS metal-dome tweeter and a Titanium super tweeter. Typical for Harbeth, the enclosure pays homage to the LS3/6 BBC with thin walls, little damping and bolted front and back panels. This is quite opposed to most modern speaker houses which pursue maximally rigid, ideally damped enclosures. All this combines into a sound so different from the mainstream and so uncommon as to create true believers, followers and even outright fanatics. Discs used for listening sessions: Thorens 125th Anniversary LP, Thorens, ATD 125, 3 x 180g LP; Depeche Mode, Sounds Of The Universe, Mute, STUMM300, 2 x 180g LP; e.s.t. Leucocyte, ACT 9018-1, 2 x 180g LP; Kraftwerk, Tour The France, EMI, 591 708 1, 2 x 180g LP; Madeleine Peyroux, Careless Love, Rounder/Mobile Fidelity, Special Limited Edition, 180g LP; The Beatles, Rubber Soul, Apple/Toshiba-EMI, TOCP-51116, CD; Sonny Rollins, Saxophone Colossus, Prestige/JVC, VICJ-60158, XRCD; Count Basie & Joe Williams, The Greatest!, Verve/Universal Music Japan, UCCV-9233, CD; Anja Garbarek, Briefly Shaking, EMI, 8608022, CCD; Bill Evans Trio, Waltz For Debby, Riverside Analogue Productions, RLP-9399, 2 x 45rpm, 180g LP; The Bassface Swing Trio, The Bassface Swing Trio Plays Gershwin, Stockfisch, SFR 357.8045.1, 180g LP + SACD/CD.